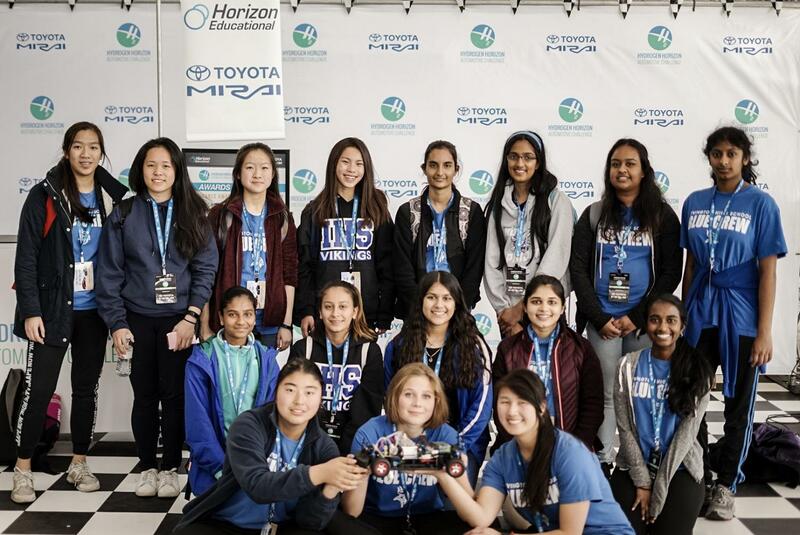 The Irvington girls in STEM team qualified for states in their first hydrogen car competition. The IHS Girls in STEM club placed within the top 10 in the Toyota Mirai Hydrogen Horizon Competition in Richmond on Sat., Feb. 24., and qualified for the State Finals in Sacramento on Mar. 10. The team, consisting of 16 students, worked on building a radio-controlled (RC) car powered by hydrogen fuel cells for the past 5 months since mid-October. The first steps involved assembling the RC car, figuring how to integrate the hydrogen-powering system to the car, and creating a video that outlined the function and potential of hydrogen-fueled cars. After months of preparations, the team competed in the Northern California Regionals to secure a place in States. The cars were first judged and inspected by a judging panel, then 20 cars from various North California High Schools proceeded to race laps around the tracks for an arduous four hours. The number of laps were logged into a leaderboard, and the team that completed the most amount of laps were the winners. The team’s pitcrew included Charlotte Matthews (11) and Jane Zhang (11), who were responsible for replacing hydrogen fuel cells and batteries, and finding solutions to fixing car malfunctions at the pitstop. The main driver of the team Patricia Cai (10) was in charge of maneuvering the RC car around the track. Mr. Fung was the team advisor and provided a meeting place, transport and guidance throughout their first year of competing in this challenge. The team encountered numerous difficulties during the competition because of leaks in fuel cells and the lengthy time that was required to replace the fuel cells. Competition became intense during the last 30 minutes when the team ran out of hydrogen fuel cells due to the leak. The team was placing 9th at the time, but because the cars stopped working for 10th place and 11th place as well, the girls clinched a top 10 spot and successfully advanced to states. Matthews believed that the most challenging difficulty was minimizing the time the car spent on the pitstop. In the states competition at Sacramento Memorial Auditorium, the top 10 teams from Northern and Southern California compete to determine the qualifier for the internationals in Germany. The team was placed 14th, and despite some minor maneuvering problems, improved their total number of laps from 218 to 325 in only two weeks time, when they analyzed and fixed their problems. The team was sponsored by Christie English, who funded the team with equipment, tools and parts. Ultimately, the team aims to create a self driving car by using this competition as a starting point to understand automotive technology. Sponsor Christie English believes it’s vital that young people get exposed to transformational technology, such as artificial intelligence, in today’s era of digital age. Should I Munch on School Lunch?